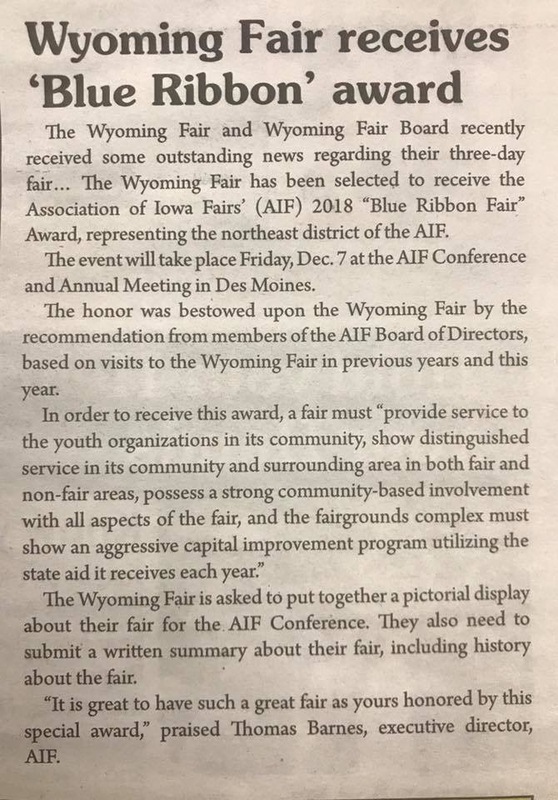 Join us Saturday March 30th at Calkins Barn in Wyoming. Meal (pulled pork sandwiches, chips, baked beans, dessert and drink for $10) starts at 5:00 then stay for trivia starting at 7:00. $80/team of 8 people. Show up with your own team or we’ll put you on a team. Join us Saturday, January 19th for our Annual Fish Fry! 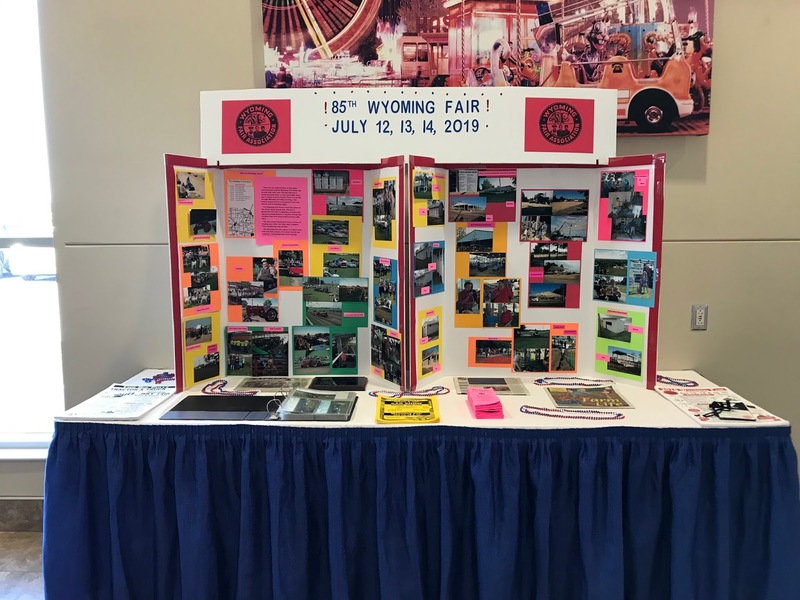 Starting at 4:30 at Memorial Hall in Wyoming. Same menu as usual: Alaskan Pollock, french fries, baked beans, potato salad and coleslaw. Also, the Jones County Cattlemen are having their Karaoke Contest at Rack's Swinging Door (right across the street!) that same evening. Warm Ups are 8:00-10:00 and the contest begins at 10:00. 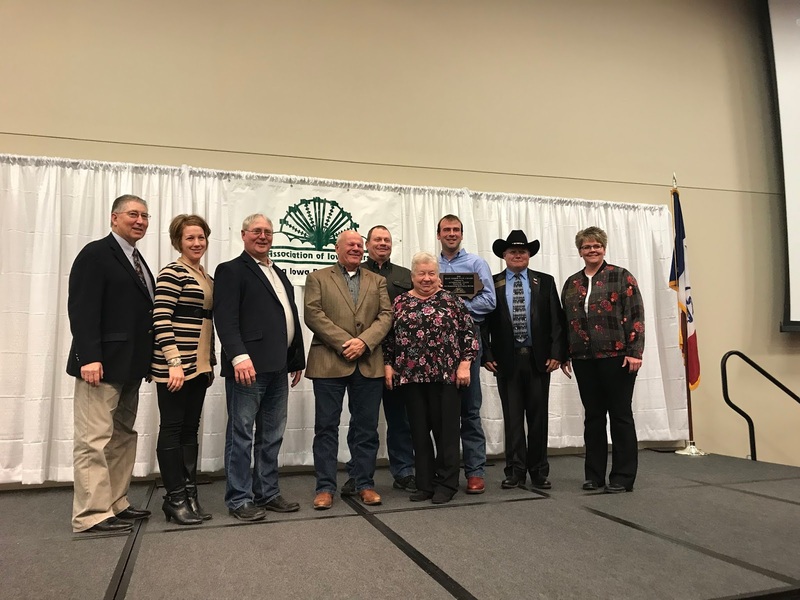 The top 5 advance to the Cattlemen's Banquet to compete for prizes. 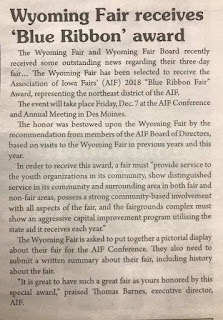 We’re proud to be named the Association of Iowa Fair’s “Blue Ribbon Fair” for the northeast district!!!! 2018 Season tickets are $12.00 per person before July 13th. Available at Holly's Town Super Market, Citizens State Bank, or any board member. FREE PARKING all day, every day! Check out our "sponsors" tab for a list of 2016's sponsors and pictures of the new cattle barn! We will be updating our Facebook page with any announcements. 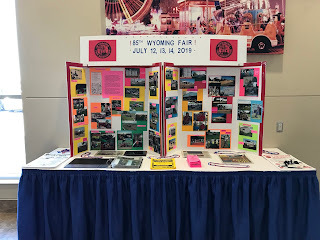 Please "like" our page https://www.facebook.com/wyoming.fair. Thank you! Friday: Admission is FREE until 6:30 pm. $5/person after 6:30 pm. Kids under 12 FREE every day. Saturday: $5/person until noon. $10/person after noon. Kids under 12 FREE every day. Sunday: $5/person all day. Kids under 12 FREE every day.